Every product has its “classics,” from motorcycles to jackets, from lawnmowers to cellphones. That’s right, ladies, this includes handbags. If 2018 and Saint Laurent were to have a “classic,” it would definitely have to be the stunning Saint Laurent Lou camera bag. Just looking at this bag, you get a sense of prestige and splendor. Its color and shape make it a perfect addition to your wardrobe for any occasion out there. You can carry it to a fancy dinner among the higher classes, or at that local café with your girlfriends or your significant other. Naturally, it will go well with any outfit, considering its shape and color. So let’s talk shape and color. The wonderful black lambskin leather gives the Lou that tough, yet soft look. Shape-wise, the Lou is rectangular with soft, rounded edges. The shape is universally adorable and chic, so it’s perfect for any occasion. Looking at the front of the Lou camera bag, you will spot the iconic YSL logo made of a golden-hued metal. Other than that, the bag has a noticeable grosgrain lining. The back of this bag has no pockets like other bags, but the bag itself is spacious and has plenty of room for your belongings. Naturally, you can’t forget the leather strap which you can adjust. The Lou camera bag can go both under your shoulder or across your body. However, you cannot remove the strap. What can you remove? 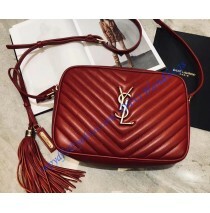 The lovely leather tassel attached to the side. It’s made of the same quality material that the whole bag is made of. The Saint Laurent Lou camera bag is 23 cm (9.1 in) wide, 16 cm (6.3 in) long, and 6 cm (2.4 in) deep. The shoulder strap drop is 62 cm (24.4 in) long, and it can be adjusted. The bag is black with golden-colored metal sections and is made of durable lambskin. 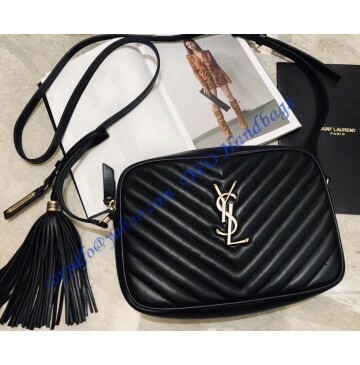 Saint Laurent Lou camera bag can be bought for $348 here.